Everything you experience in your lifetime is stored in your subconscious mind. The mind stores information as images, pictures, concepts and processes. All of the learned knowledge and experiences you are exposed to (even the thoughts you think) are added to these images, pictures, concepts and ideas. The ability to recall this information is of major concern to each of us. Our memory of this information is the groundwork for our future. Bring back those special past experiences, learn much faster and remember more. A major aid in learning and achieving your goals. This program works specifically at retaining and recalling this information simply, easily and effectively. 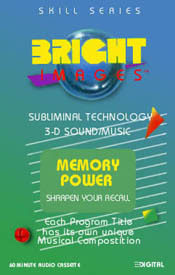 It deals with remembering studied materials for tests and exams, or remembering anything you choose.